THRISSUR, India (CNS) — The church in India has expressed shock over the deaths of more than a dozen young mothers in government-run sterilization camps in central Chhattisgarh state. 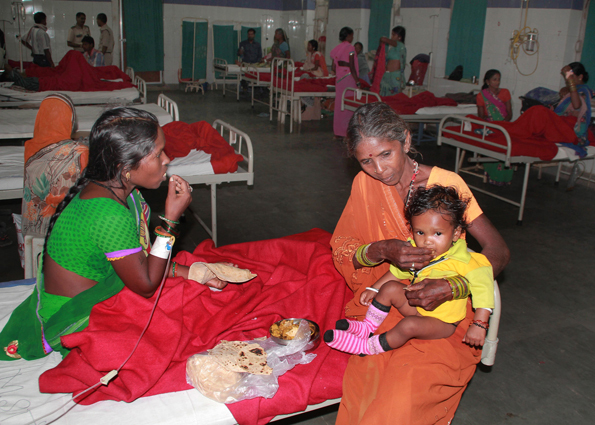 “This is terrible,” Archbishop Prakash Mallavarapu, chairman of the health care commission of the Catholic Bishops Conference of India, told Catholic News Service Nov. 12 from his Visakhapatnam Archdiocese. While 12 of the 83 poor village women who underwent free government sterilizations at a private hospital in Bilaspur Nov. 8 died of subsequent medical complications after being sent home, local government officials said at least 20 more women were critical and were being treated in different hospitals. Meanwhile, another young mother who attended a similar sterilization camp also died Nov. 12, raising the death toll to 13. Following the national furor over the rising deaths from the botched surgery, police have registered criminal charges against half a dozen health officials, including senior Dr. R.K. Gupta, who performed more than 80 sterilization surgeries, more than double the limit for one day. “What is the motive behind such sterilization camps? Is it for the need of the people or to meet the sterilization targets of the government?” he asked. “This tragedy brings to light the pathetic state of health care in rural areas,” added Archbishop Mallavarapu. Sterilization has been a population control method in India for decades, with the government setting targets for each area and providing incentives to those who undergo the surgery, health workers who bring “volunteers” to such camps and health workers who conduct the surgery.